Tactical Trekker: Respect The Mountain! "This past Sunday, Jan. 20, I set out to climb Mt. 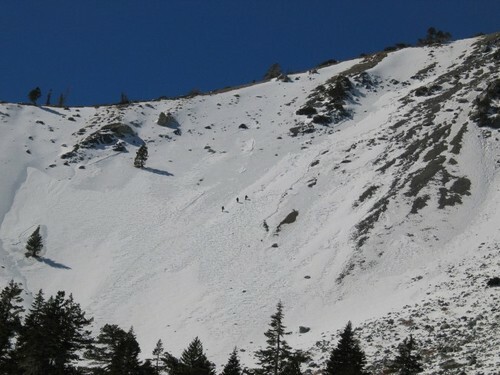 Baldy primarily to practice some of my climbing skills and get a work out in." "My plan was to ascend up the Bowl face and descend down Devil's Backbone. I started about 6:00 a.m. and reached the summit at 9:45 a.m. after having some fun climbing up the bowl and doing some rock scrabbling/bouldering in my crampons at a spot I found near the summit. 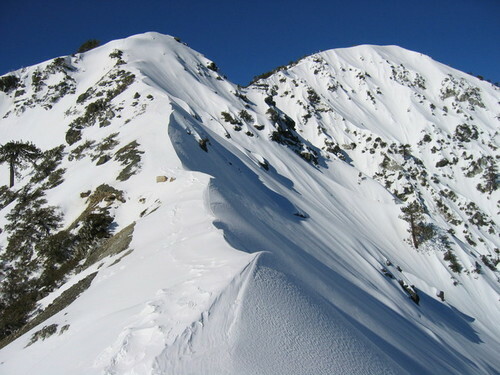 I got a lot of good practice in and felt really strong and confident on the ascent, which was my first ascent up the 45-degree bowl face. "Right before I reached the cabin that lies about 200 meters before the start of the bowl face, I passed an older man on the trail and spoke with him for a few minutes. "He too was planning on climbing the bowl and seemed like he knew what he was doing, more so than I did. After some small talk I went on my way and he stayed a little bit long to take a break before the hard part of the climb. "When I got near the top of the bowl, which took about 30 minutes, I stopped at a protruding rock to shed a layer and take a picture. I saw the man towards the bottom of the bowl ascending upward and from the looks of it he seemed like he was doing pretty good. "I didn't waste any time and continued on to the summit and probably no more than 30-45 minutes later that man, Dominic Belletti, fell down the bowl to his death. "Because I went down the backbone of the mountain pretty quickly I didn't find out anything until later that evening when a buddy of mine called and told me. "I don't know how he might have fallen. But I think he was in micro spikes opposed to crampons, although he did tell me he had crampons in his pack. "It also looked like he didn't have an ice axe, he only had trekking poles. As an amateur mountaineer I just assumed that the man knew what he was doing and if anything I would be the one who would be pushing my skills and gear to the limit more than he would be. "I turned out to be wrong. "This incident really upset me because he seemed like a nice and knowledgeable guy, let alone a fellow outdoorsman. "But it shows me that every mountain must be respected and as a mountaineer you must be as prepared as you possibly can be to take on the mountain you intent to climb. "It also solidifies something I feel is the thesis of climbing and mountaineering and that is, you cannot be prepared enough. This saying goes in two directions. "The intuitive meaning is that one should take every measure to eliminate unnecessary and potential danger while on the slopes. Whether it’s bringing the necessary gear required to climb and knowing how to use it or confidently knowing the route you will be taking and having a contingency plan in case things don’t work out as you planned (a.k.a “Turning Back”). "However, this saying also tells us to respect and know your limitations as a human being. At the end of the day, we are no match for Mother Nature and if we intend to reach our goals as mountaineers we must respect and recognize that. "Being only half-way through my first season as a climber and mountaineer I can say that I have learned a few lessons that no book and no guide can teach you. "I don’t consider it luck that I have learned these lessons but I consider it a passion for the sport. A passion so great I want to continue doing it for many years to come. I wanted to share this experience with all of you and I wish you all safe climbing in the future." Ignore that advice at your own peril.